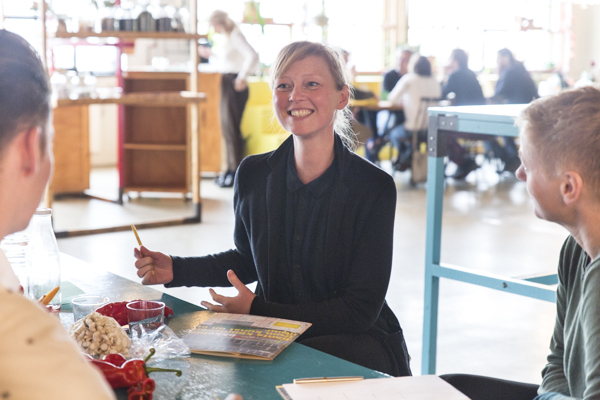 During Dutch Design Week 2016, a new Agri meets Design Food Lab was launched: Food Heroes. This European programme focuses on innovative food entrepreneurs working on the reduction of food losses in the neglected first parts of the food chain. The aim is to prevent food being produced for human consumption to go to waste and therefore degrade in the food waste pyramid to a lower value level. In the battle of reducing food waste the selected food entrepreneurs are paired up with designers in their search for surprising and effective solutions – these farmers and designers are the Food Heroes! According to the Food and Agricultural Organization (FAO), a third of the food produced worldwide is being wasted. This is not only the food loss itself we face, but also a huge loss of valuable resources. Considering the growing world population that we need to feed, and the climate change we are facing, food loss is no longer an acceptable part of a sustainable food system. In the Netherlands, approximately 150 kilos of food per person per year is being wasted, food that could have been consumed. Recently, food waste found its way onto the public agenda, mainly focussing at the end of the chain: points of sales (supermarkets, catering) and the consumer. However, at the beginning of the chain, in the agricultural production and processing, many food waste occurs. About 30% of all food wasted across the food chain happens on-farm. An example of why food is being wasted are 2nd and 3rd grade fruits and vegetables that don’t have the perfect shape or colour. Nowadays, the focus in the food chain is on the first-class product that can be sold in supermarkets and meets the quality requirements of the customer. Everything else is hardly appreciated, although it is often a perfectly edible product. In order to utilize these products, we need solutions which add value to these products. A shift in thinking is needed. The Food Heroes are going against the great current of nowadays thinking taking on this challenge. Ten artists and designers with an interest and experience in biobased/ circular issues joined the matching event in 2016 including Chloé Rutzerveld, Christien Meindertsma, Jalila Essaïdi, Eric Klarenbeek, Tjeerd Veenhoven, Simone de Waart, the FoodCurators, Lobke Meekes, Isaac Monté, and Doreen Westphal. During the speeddates, they were given the time to meet the farmers and their cases. These five couples will work together for a year to develop creative solutions for the 2nd grade products and residual flows of the agricultural entrepreneurs. The artist will indulge him or herself in the company to get a full understanding of the problem and the praxis of the particular farm. In cooperation with the farmer a proposal for a new approach will be developed. What follows next is the design process and a period of trial and error to test the design. During Dutch Design Week 2017 several outcomes will be shared in The Embassy of Food. Please check out our Embassy page for the program. This project embraces a co-creative design approach in order to collaborate across NW Europe between innovative regions and its followers. In Food Heroes the capacity for eco-innovation will be enhanced by boosting the speed of innovation adaptation from innovation leaders (Province of North Brabant, South Ireland, State of Hessen Germany) to innovation followers (Lincolnshire, rest of Ireland, Flanders, West of France). Food Heroes is being organized by ZLTO, Dutch Design Foundation, Province of North Brabant and BKKC with support of Agricultural Innovation North Brabant, the Impulsgeldenprogramme and the EU NTERREG Vb NWE (North West Europe) programme. Agri meets Design is scouring the Netherlands for pressing questions from the agricultural industry, from large or small players, from the farm or policy departments. We will then attempt to and a good match between the questioners and the designers. The outcome of a collaboration is never set at the start and that delivers unpredictable and interesting outcomes to the most persistent social issues. That is the exceptional working method of Agri meets Design. Want to get in touch? Please contact program manager Judith Zengers via judithzengers@agrimeetsdesign.com. Meld je aan voor onze nieuwsbrief en ben als eerste op de hoogte van onze bijeenkomsten, oproepen tot samenwerking en het laatste nieuws.